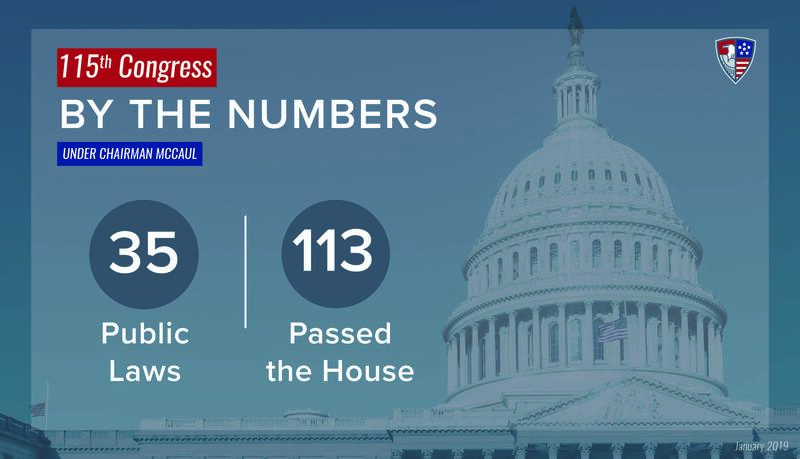 Washington, D.C. – House Homeland Security Chairman Michael McCaul (R-TX) released the following statement highlighting the Committee’s many legislative accomplishments in the last session of the 115th Congress. This includes legislation to secure America’s borders, protect against cyber-attacks, ensure that the Department of Homeland Security (DHS) runs efficiently, and shield the homeland from both international and domestic threats. With over 113 Committee bills passed through the House and 35 of those bills becoming Public Law, Chairman McCaul finishes his six-year leadership role on a strong note. Chairman Michael McCaul: “It has been a great honor to serve this committee over the past six years. Throughout my tenure, I have seen the rise of ISIS, and fall of the Caliphate while working closely with U.S. law enforcement to tackle our most menacing threats to national security both at home and abroad. All the while, this committee has been a model for others in Congress to follow and I am proud that we put the security of our homeland above partisan politics. Together we passed the first ever, comprehensive reauthorization of the Department of Homeland Security, strengthened partnerships between federal, state, and local law enforcement, and enhanced cyber information sharing between the public and private sectors. “In the past year alone, we have elevated and operationalized DHS’s cyber structure, reauthorized TSA for the very first time, and passed important legislation to counter weapons of mass destruction and the rising threat of unmanned aerial systems. In addition, we enacted vital legislation to counter human trafficking and opioids. We have accomplished an extraordinary amount but there is still a lot of work to be done. We must stay one step ahead of our enemies. H.R. 3359, Cybersecurity and Infrastructure Security Agency (CISA) Act, was signed into law on November 16, 2018 (P.L. 115-278), to streamline the current structure of the National Protection and Programs Directorate (NPPD) and re-designate it as the Cybersecurity and Infrastructure Agency (CISA) to more effectively execute cybersecurity and critical infrastructure related authorities. H.R. 7213, Countering Weapons of Mass Destruction, was signed into law on December 21, 2018, to redesignate the Department of Homeland Security’s Domestic Nuclear Detection Office as the Countering Weapons of Mass Destruction Office (CWMD Office). This Office will coordinate with other Federal efforts and develop a strategy and policy to plan for, detect, and protect against unauthorized chemical, biological, radiological, or nuclear materials or devices in the United States. H.R. 6401, Preventing Emerging Threats Act, was signed into law as part of FAA Reauthorization Act of 2018 on October 5, 2018 (H.R. 302, P.L. 115–254), to provide the Department of Homeland Security (DHS) and the Department of Justice (DOJ) with the authorities they need to protect communities and buildings from security risks posed by unmanned aerial systems (UAS), or more commonly referred to as a drone. H.R. 4708, Department of Homeland Security (DHS) Blue Campaign Authorization Act, was signed into law on February 14, 2018 (P.L. 115-125), to help protect victims of human trafficking by providing the right tools to federal, state, and local law enforcement, as well as private sector organizations to increase awareness and better defend against this heinous threat by requiring the Secretary of Homeland Security to issue Department-wide guidance and develop training programs as part of the Department of Homeland Security Blue Campaign. H.R. 2142, International Narcotics Trafficking Emergency Response by Detecting Incoming Contraband with Technology (INTERDICT) Act, was signed into law on January 10, 2018 (P.L. 115-112), to provide U.S. Customs and Border Protection (CBP) the necessary tools, such as hi-tech chemical screening devices, to help detect and interdict fentanyl and other illicit synthetic opioids. H.R. 4760, Securing America’s Future Act, was introduced on January 10, 2018, to bolster the enforcement of existing immigration law, make important reforms to our legal immigration programs, secure the border, and provide a legislative solution for the current beneficiaries of the Deferred Action for Childhood Arrivals (DACA) program. H.R. 6439, Biometric Identification Transnational Migration Alert Program (BITMAP) Authorization Act, passed the House on September 4, 2018, to establish in the Department of Homeland Security the Biometric Identification Transnational Migration Alert Program (BITMAP) to help prevent potential terrorists and dangerous criminals from entering our country. NOTE: A full list of committee bills from this Congress can be found here.